With over 25 years experience as a bricklaying contractor to the majority of the UK’s major house builders, we have set and maintain the highest standards of quality in a cost effective and timely manner. and have achieved CHAS (Contractors Health and Safety Assessment Scheme) accreditation. We have a workforce of approximately 200 bricklayers all of which hold appropriate CSCS (Construction Skills Certification Scheme) cards. 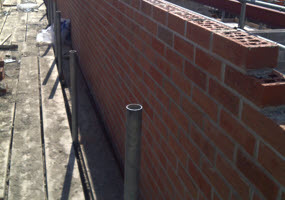 Our bricklayers are supported by a team of quantity surveyors and on site supervisors. We also have a dedicated in-house health and safety officer. We are proud to have won many NHBC “Pride In The Job” awards most notably achieving the “National Supreme Winner” award at Persimmon Homes, Wyncliffe Gardens, Cardiff in 2008, 2009 & 2010. The safety of our workers, and others who may be affected by our work, is a top priority for us and we always carry out site specific risk assessments and method statements.